Yeah so as you might know i am currently in Slimming World and i have lost nearly a Stone. Still got a few more stones to loose but i am already fitting into my older clothes (not all but some). But i am hoping this summer i will feel comfortable in wearing a dress for my 21st birthday when i go out with the girls! 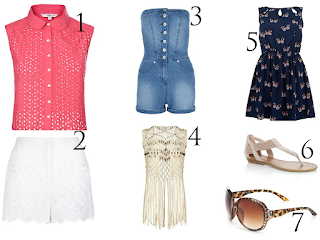 Here a few clothes i like from my favourite shop New Look! 1. I love this top! Looks light a very summery! Great with or without a vest top underneath. 3. Ahh i wish one day i could fit into something like this! I WILL get a good figure :-) haha. 4. I love this cardi! It'll look lovely with a vest top and shorts or jeans or maybe even leggings! 5. Love dresses like this, but i like tight dresses too but i've always had big hips so a dress like this goes with my figure better! 6. Ahh love these sandals! So cute! They would go with pretty much everything. And i think the back of the sandal is ideal! 7. I love leopard print! So these sun glasses are perfect! Love them!